The PA system near the start could have been louder. It seemed that the speakers were pointed away from the runners, because they were louder when I was in the spectator area before I lined up near the start. 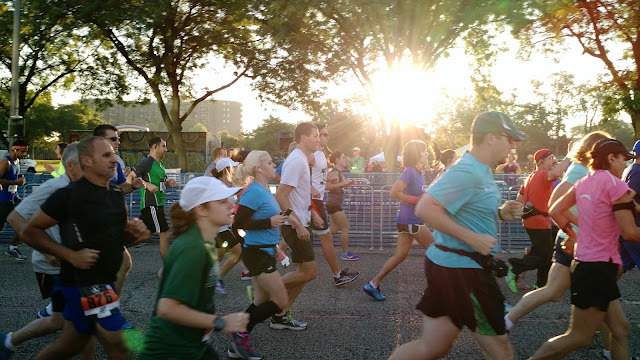 I kept looking at my watch as the clock neared 8 a.m., but I and the runners around me seemed surprised when the runners at the front of pack started running. I think there was a collective "Oh, I guess we're starting" from the runners in the middle and rear of the pack. The first three miles of the race were along Michigan Avenue. The sun was rising directly in front of us, so I tried to run near the buildings on the right side of the street to keep from being blinded by the sun. Remembering how I burned out too quickly twelve years earlier, I restrained myself from running too fast by hanging several seconds behind the 9-minute-mile pacer. After mile 3, we entered the heart of Michigan State University's campus. As a Wolverine, I picked up my pace a little to try to get through the heart of darkness as quickly as possible. In all seriousness, the campus was much nicer than Michigan Avenue, since we were able to run near the Red Cedar River for three to four miles, and the green-and-white-clad spectators were cheering everyone on (though I wisely did not wear maize and blue). The first 9 miles felt like the larger marathons or 5Ks I've run. Spectators lined the course. Kids cheered and gave high fives to runners. The pack of runners was large, and I was able to pace myself off of two or three runners who seemed to be running even splits. But everything changed shortly after mile 9. I knew the half and full marathon courses diverged shortly after mile 9, and I knew there were only about 200 marathon runners, as opposed to 1,300 in the half. I was nervous that I would accidentally follow the half marathoners at the split, but the race organizers had well-marked signs warning that the split was coming up, as well as volunteers (and more signs) telling runners where to go at the point where the courses split. I joked to the volunteers that my run was about to get lonely. And I was right. As I veered to the left, the pack I was running with continued to the right, and I was by myself with only a few people about 100 yards in front of me. 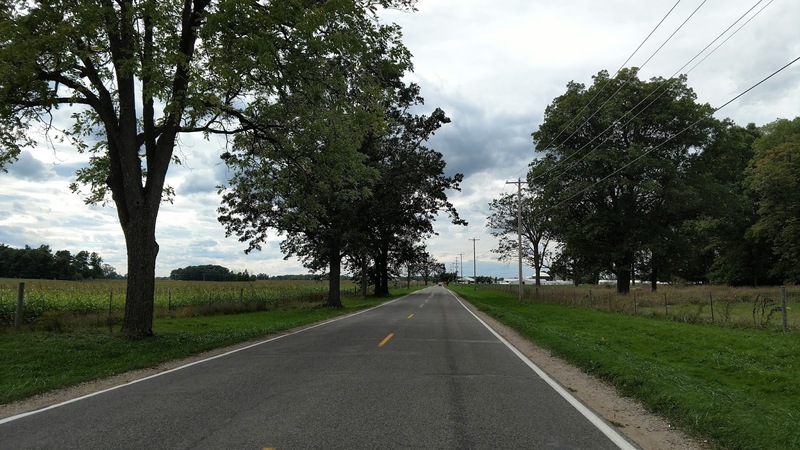 The next ten or eleven miles were a no man's land consisting mainly of farmland. Except for volunteers at water stations and police directing traffic, there were few spectators to cheer me on, which might discourage runners who need crowds, but I found the solitude to be refreshing. I could listen to my breathing and focus on running my own race. My two biggest gripes about this section of the course were the lack of shade and the lack of obvious mile markers. Unlike the stretch along the Red Cedar, there were no trees to protect runners from a surprisingly warm and sunny day (It was supposed to be cloudy!!!). I also do not know if I missed mile markers, but I found myself running two or three miles at a time without seeing a marker. 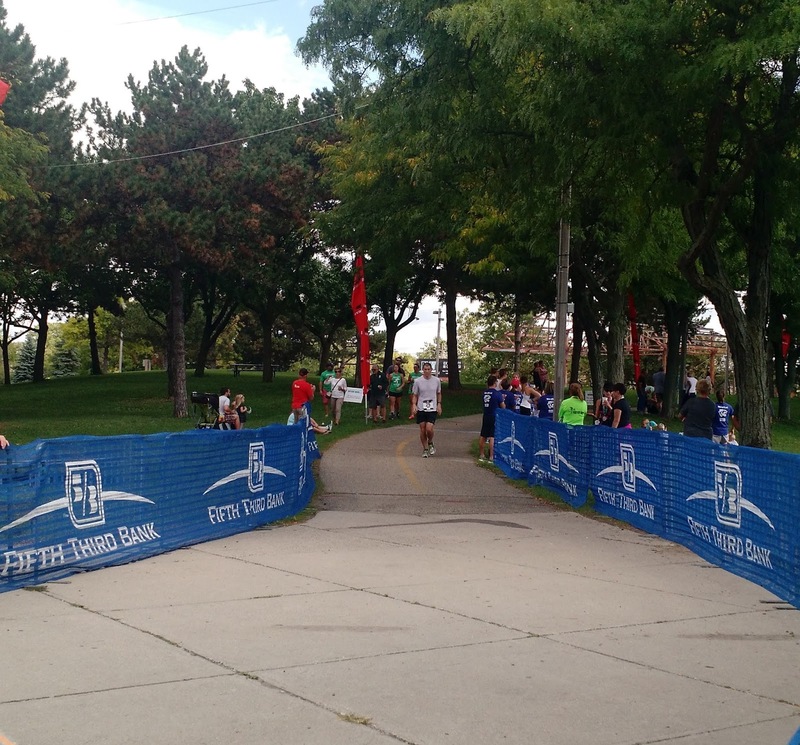 Near mile 20, the course hooked up with the Lansing River Trail, where it ran through Hawk Island Park and alongside Sycamore Creek. At Hawk Island Park, I was tempted to hurl myself into the water to cool off as I was feeling overheated and exhausted, but I labored on. Sometime between the halfway point and mile 20, I knew that I wasn't going to beat 4 hours, but my secondary goal was to set a personal best. As long as I didn't break down and walk the last 6 miles, I would run my fastest marathon. I did walk a couple of times for about 8 minutes total after mile 21, but I never felt the extreme soreness in my legs that I did in my first two marathons. I felt exhausted enough to walk, but I knew I wouldn't be walking too much, just enough to refocus on running the last few miles. The Lansing River Trail was mostly shaded, but my only complaint was that the trail was open to the public. 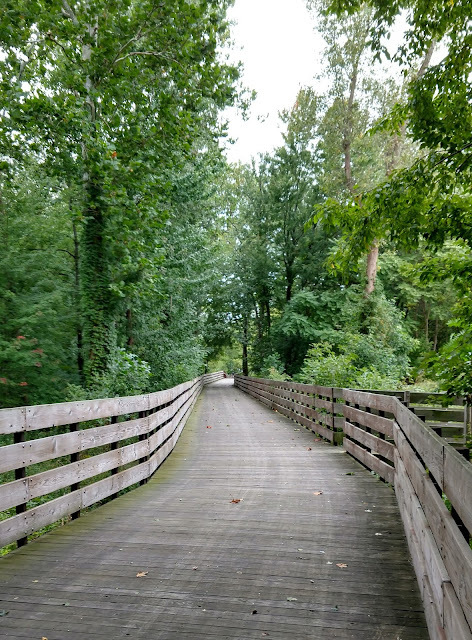 As I was struggling to stay on my feet the last two miles, I had to dodge a couple of bikers and one lady with a dog that wandered into my path. It would be nice if they could close the trail off to non-racers for an hour or two, but I survived. The mile 25 marker was the sweetest part of the marathon. Now, I believed spectators who screamed, "You're almost there!" I found a gear I had lost miles earlier and gradually picked up my pace. As I ran alongside the Grand River, I began to hear the PA announcer announce finishers as they crossed the finish line. I finally reached the bridge across the river and crossed it with the finish line in sight. As I neared the finish line, the PA announcer informed the crowd who I was, and I, in my worn-out state, decided to hold up each hand with my fingers in a v for victory and immediately thought, "What a dork! Who are you? Richard Nixon?" 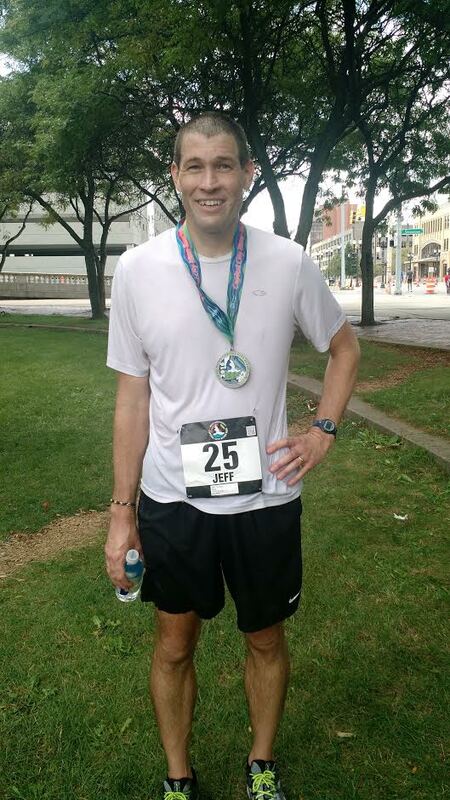 But I didn't care because I crossed the line with a new personal best by more than 20 minutes. The post-race atmosphere in Adado Riverfront Park was great. They had doughnuts, fruit, water, and pizza. There might have been more food and drink, but I went straight for the pizza and grabbed a couple of meaty slices. I then sat on the lawn, ate my pizza, and drank a bottle of water until I found the strength to stand up and begin walking toward our car. I was thinking of going to one of the restaurants that offered special deals to runners, but I just wanted to head back to the comfort of my own home. The race could have used more porta-johns at the start, and better located ones along the course. (Some were out of the way, and adding extra distance to marathon is never fun.) The mile markers were also nonexistent or difficult to find at times. On the plus side, the aid stations were well run, with plenty of water and Gatorade, and the volunteers along the course, as well as the police directing traffic, did a great job. Overall, I enjoyed the marathon. For someone who does not mind a little solitude while running, it's a great race. Runners who need large crowds to feel motivated might find it difficult and may want to stick with the half marathon or the 5K. I did it and was still standing.